Two / Double storey side extension - architectural design drawings, planning permission submission and structural engineering calculations / steel reports and building regulations submission / approval. 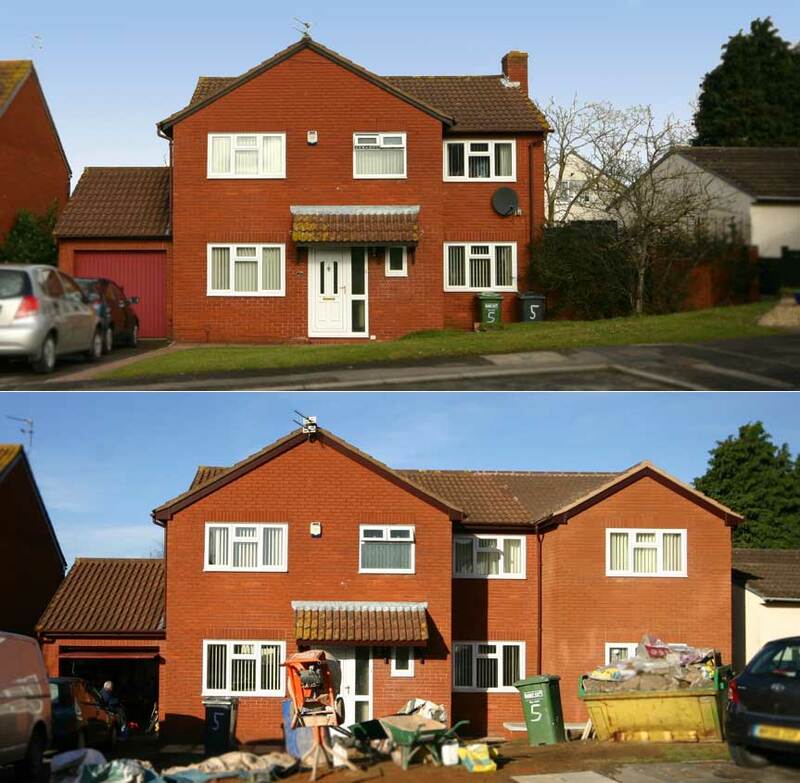 This large two storey extension increased the total floor area by about 60% ! By extending into all the available space to the side of the house coupled with the very attractive front gable extension, the end result added a large master bedroom, single bedroom and a beautiful 28 foot lounge running from front-to-back on the ground floor. Without the extended gable to the front, the house would have looked very plain and would not have enough space for the two bedrooms at first floor. Single storey rear extension - architectural design drawings, planning permission submission and structural engineering calculations / steel reports. 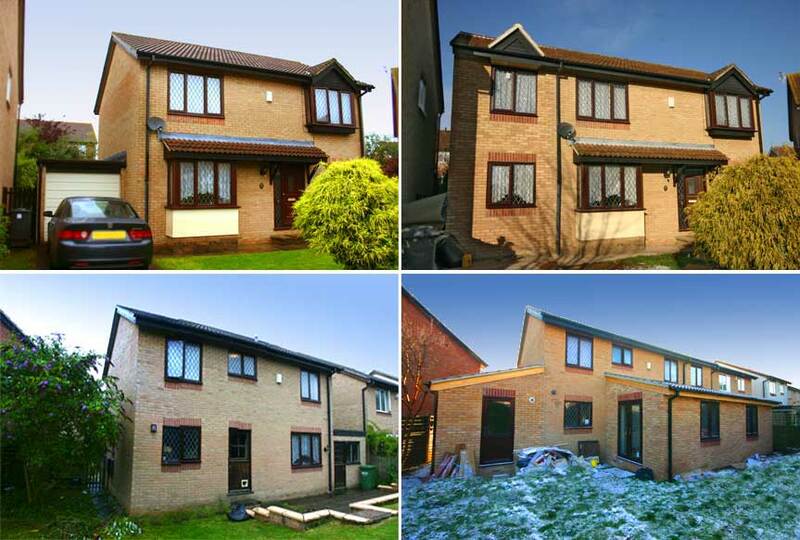 This project involved extending both houses with a large rear extension. By discussing the project with the neighbour, he was very keen on having a similar extension. Therefore, extension designs were completed for both homeowners and separate planning applications were submitted and approved by the local authority. By having both extensions constructed at the same time, the party wall separating the two extensions could be shared... this provided additional space for each homeowner and saved in the construction costs ! Rather than a flat ceiling in each extension, the ceiling is sloped with large roof windows providing a bright and open additional living area. Single storey garage extension incorporating front porch. Architectural design drawings and planning permission submission and approval. Although the space to the side of the house was limited by the boundary at 45 degrees to the house, with careful thought and 'clever' design, the extension utilised all the available space. The front wall of the extension was brought forward providing a deeper garage, which also allowed a large front porch. To the rear of the garage, the side wall follows the angled boundary to get the most from the space. The hipped roof over the extension has been 'pushed' towards the back of the house, to minimise the height of the roof over the porch.... thus avoiding a steep and unsightly roof. 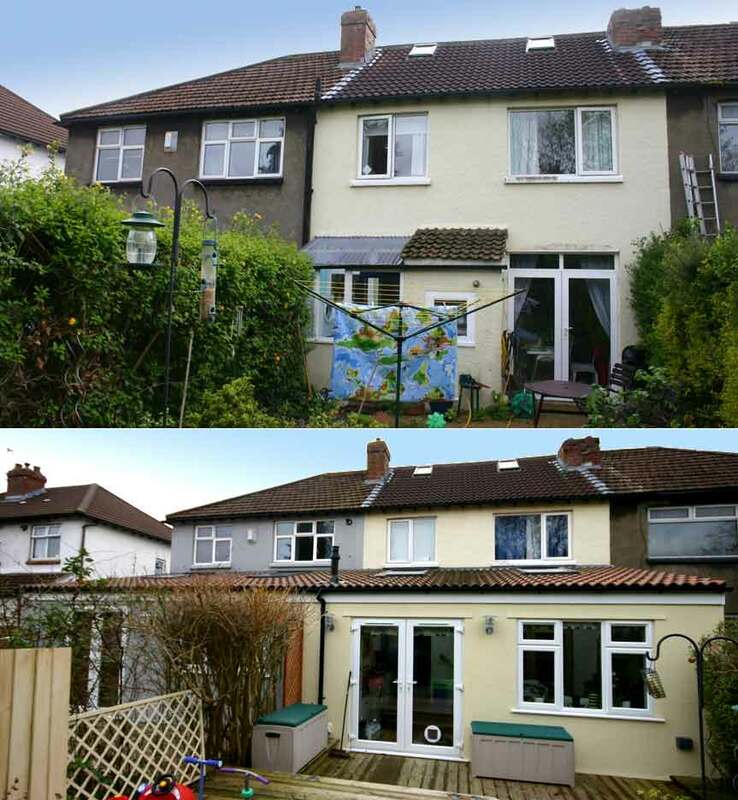 With matching render and grey tiles, this valuable extension blends in perfectly to the existing house. Two / double storey over garage side extension, single storey rear extension and single storey side extension - architectural design drawings, planning permission submission and structural engineering calculations / steel reports and building regulations submission / approval. With the need for additional space and hosts to frequent extended-family gatherings, our client selected from a number of possible additions that could be added to their house. To maintain the flow around the home and make best use of the additions, the design was thought through carefully to ensure the best solution was achieved for the homeowners. The two / double storey side extension was added to the space where the garage once stood. The former external wall was removed between the lounge and former garage giving a large, spacious and inviting new lounge. At first floor, two additional bedrooms were created with spacious built-in wardrobes. To blend in with the existing house, a small feature gable was added above the first floor window, as shown in the photo top-right. The rear extension has a large banquet dining table with roof windows above. French doors and windows provide ample light and overlook the garden. The single storey side extension enabled the kitchen to be extended, new utility room and a cloakroom/toilet. These additions will have added enormously to the value of the house and resulted in a beautiful large family home. Two / double storey side extension and single storey rear extension - architectural design drawings, planning permission submission and structural engineering calculations / steel reports and building regulations submission / approval. Shown above are two of the many architectural design drawings that were submitted for planning permission and subsequently approved. Note how the roof will be much higher in the proposed drawing. The matching gable above the former garage blends in seamlessly with the existing house. The simpler design solution would have been to extend above the garage, with the new first floor wall in line with the existing wall. However, a far more appealing design is that shown above... this design provided far more space at ground and first floor, and also results in a far more attractive front elevation.... which the Local Authority agreed with and approved immediately. As with all Planning Permission applications, it is very important to submit accurate drawings and designs. 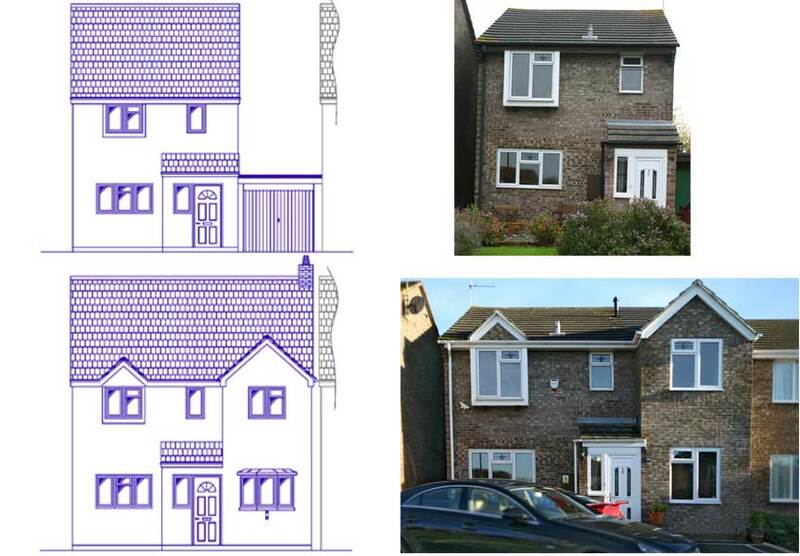 Here you can see how the front elevation drawing as an exact match of the actual house. This ensures the build can progress by the builder, knowing that the drawings are accurate and no mistakes exist. Midway through construction, the front gable wall can be seen in the lower-right photo. The garage and door have been replaced with the wall extending up to the new gable, obscured by the weather sheeting. The opening can be seen in the new dining room, in preparation for the fitting of the new windows. Top-left , the roof of the garage has been completely removed, and new external walls built up. The exposed wall can be seen made up of brick and block... originally enclosed by the garage and roof. The new ceiling/floor joists are fitted and the external walls continue to be built up. Note the scaffolding and 'lid' to keep the wind and rain at bay. This allows the build to continue in poor weather, ensuring build progress is maintained and the disruption to the home-owner kept to a minimum. Top-right shows the walls built up to first floor and the ceiling joists fitted. Note that the tiles on the existing roof are still in place and the new roof construction has not yet begun. Top-left shows the new roof mid-way through construction, all under the shelter of the 'lid'. The tiles have been removed from the existing roof and the new roof is added. Here you can see the height difference of the old and new roof. The new hips are already in place with the remaining rafters to be cut-in. Top-right, you can see the new rafters in place. The horizontal timber projecting towards the left will eventually become of the ridge of the new gable to the front of the house. Just visible is the opening for the window at first floor, with the steel lintel over the opening, ready to support the masonry gable wall. Single storey side / rear extension - architectural design drawings, planning permission submission and structural engineering calculations / steel reports and building regulations submission / approval. The old 'outhouse' can be seen in the left-hand photo. This has been replaced by a large single storey extension, spanning half the width of the rear of the house and extending all the way to the boundary. The block wall follows the boundary towards the front of the house, adding further space for an extended kitchen and cloakroom/WC. The existing kitchen was replaced, with additional units fitted to the side extension with roof window above proving extra light. The available space to the side of the house was only ever used to access the side door, shown in first photo. Mid-way through construction, the side extension projects forward (photo 2), enabling the additional space to be used for the kitchen extension. With the kitchen almost completed, the roof window can be seen flooding the area with light (photo 4). The former external wall has been opened up, with steels supporting the walls above, to blend the old kitchen space with the new. The old doorways can be seen boarded over to keep out the elements, while the extension is constructed. The opening for the French doors can be seen in the rear wall of the extension, with a row of red-brick over the lintel. The right-hand photo looks towards the rear extension from within the old kitchen area. The new units can be seen on the right, looking into the extension and French doors in the distance, with roof windows above. To the left, the opening in the external wall shows the extended kitchen. Taken from within the extension, the opening from extension into kitchen can be seen with the cloakroom to the right. The French doors and roof windows provide ample light into the extension. Oak flooring finishes a lovely extension, providing an extended kitchen, large dining room and cloakroom/WC. Two /Double storey side and rear extension - architectural design drawings, planning permission submission and structural engineering calculations / steel reports and building regulations submission / approval. This very typical semi-detached house had a small side extension added many years ago, as shown in the photo above-left. The adjacent photo shows this small extension removed, ready to begin the process of adding a large two / double storey extension. The various stages of the build can be seen in the photos below. Above shows the foundation dug out and already filled with concrete in preparation for the wall to be built up. The former internal wall of the house can be seen, as well as the cistern of the former toilet ! The side extension is flush with the front of the house... however, to provide a much larger ground & first floor, the extension projects into the rear garden by several metres, with an attractive gable roof, as shown in the last of the series of photos. Mid-way through construction, the side extension has an external door to the store, and window to the utility. As is very clear from the right-hand photo, the space to the side of the house has been fully utilised coupled with careful design to maximise the space, to result in a large and valuable addition to the house. The photo on the left shows the ground floor, with suspended timbers forming the floor, prior to insulation and boarding. Nearest the camera will be a utility room, shower room and store room, leaving ample space for the family/play room with French doors in the side wall that will open onto the garden and a large window in the end wall, flooding the room with light. At first floor, the construction of the gable roof can be seen in the right-hand photo, showing the former external wall in brick, with the extension projecting beyond the rear wall in grey blockwork. 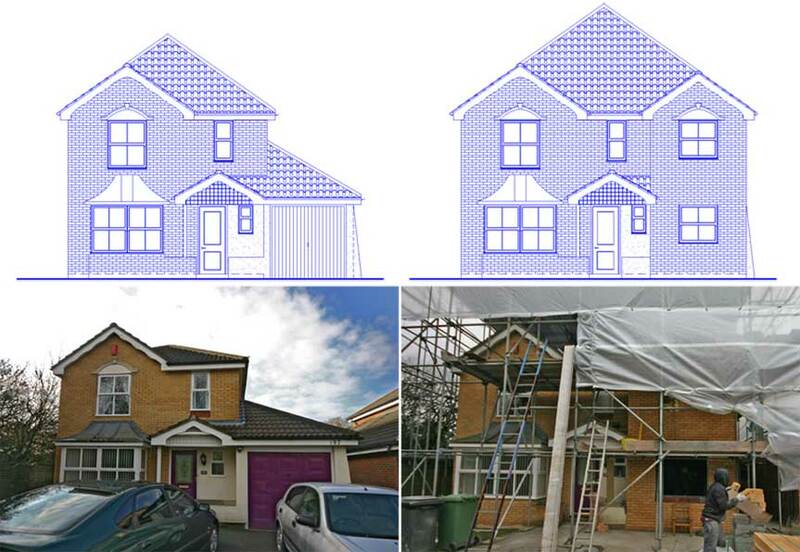 Showing the original rear elevation with former small side extension (left-hand photo), the right-hand photo shows the side extension and depth of the rear projection of the gable, adding significant space and value to the home for only a small increase in construction cost. With the position of the gable extension and French doors, a natural secluded patio area is formed overlooking the large enclosed garden.